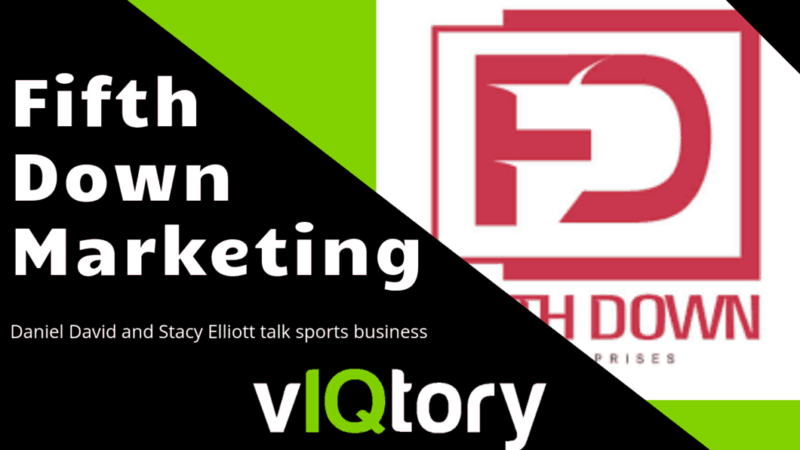 On this episode of the vIQtory podcast we are joined by Stacy Elliott and Daniel David of Fifth Down Marketing. Fifth Down Marketing is a marketing agency that focuses on building the brands of the individual athletes that employ their services. Stacy Elliott is the father of Ezekiel Elliott, the franchise, star running back of the Dallas Cowboys. Stacy provides insights on not just building Fifth Down Marketing, but also on growing the brand of one of the NFL’s most prominent players. Daniel David also spear-heads Fifth Down Marketing. He details his story coming from Ohio State and offers his perspective on the sports business landscape as well. Check them out at FifthDownEnterprises.com, on Twitter @FifthDownmgmt, on Instagram @fifthdownmarketing and on Facebook as well. Be sure to go to viqtorysports.com and check out our YouTube channel! DD: you know Stacy, what I love about this is when you were doing Ezekiel’s you know branding you know after college you know I was working on Braxton, I would always look and see what you’re doing and make sure I was trying to be ahead of you right – so you did something I would try to do for Braxton it was that competitive nature Ezekiel vs. Braxton you know and I was like man it was fun though because if you aren’t doing it who would I be competing with? SE: You’re right – Ezekiel Elliott and Braxton Miller are the biggest brands to come out of Ohio State and really college football modern history. CH: yep so Instagram is the way to go you think for a kid? SE: attention in your child’s life because at times i even have to have body guards with my children. CH: so as a marketing company how easy is it for you guys to ask for equity is it more the leverage play of who the brand is or is it more of hey we’ll do this but we want X amount of equity and they just like okay with it or is it have that partnership with.. SE: the thing about Ezekiel Elliott that’s unique is that as his brand gets bigger his family’s brand gets bigger too his parents his sisters you know he hasn’t married and had children yet so it puts us in a very unique situation I know many NFL fathers one of my good friends is Odell Beckham senior and me and him we’ve been all around the country we’ve been on SportsCenter, ESPN but I’m more recognizable by face than he is and he’s more recognizable my name than I am, obviously being Odell Beckham SR.
CH: that’s awesome I like the the walk-on I’m glad you brought that up the walk-on because he’s oh he’s always gonna had that chip on his shoulder right he’s always gonna have whether it be in the NFL wherever he takes in life it’s always got that walk-on mentality of oh you thought I’m not good enough well let me prove you wrong right and that’s and that just ties into grit. SM: yeah that’s awesome I mean obviously at some point it doesn’t matter how good you are father time catches up with you and you have to have that sort of exit strategy of okay what’s next so the fact that you guys recognize that embrace that it is only gonna serve you know Braxton, Zeke and everyone else in the Fifth Down family you know it’s gonna certain dividends . Chris did you have anything else? DD: Thank you. we appreciate the support. I mean from what I see I everyone hates Ohio State so it’s like we love the guys we work with and work for and I like you guys are awesome, like Boston , UMass, lets go! Boston College even.